The Northampton Herald and Post has published a list of five famous World War I soldiers from the town. 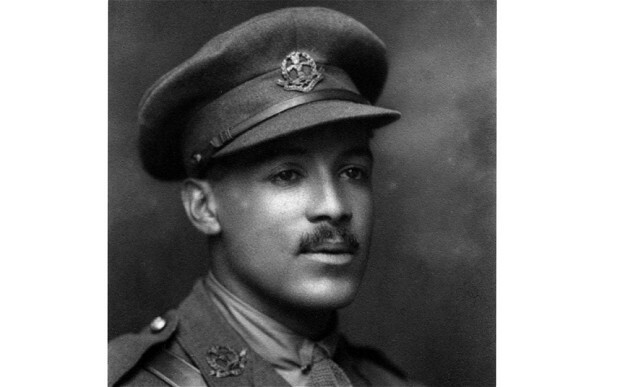 Lieutenant Walter Tull was the first black officer in the British Army. From 1911-1914 he played 111 matches for Northampton Town FC and had previously played for Tottenham Hotspur. In 1914 he joined the Middlesex Regiment and was later commissioned. He was killed on 25 March 1918 during the German offensive on the Western Front while leading a platoon of 23rd Battalion, Middlesex Regiment. He is commemorated on the Arras Memorial to the Missing. Captain Anketell Read VC was an officer in the 1st Battalion, Northamptonshire Regiment and a former heavyweight boxing champion. His VC citation reads: ‘On 25 September 1915 near Hulluch, France, Captain Read, although partially gassed, went out several times in order to rally parties of different units which were disorganised and retiring. ‘He led them back into the firing line and regardless of danger to himself, moved about under withering fire, encouraging them, but he was mortally wounded while carrying out this gallant work. He had shown conspicuous bravery on other occasions, particularly on the night of 29/30 July when he carried out of action an officer who was mortally wounded, under a hot fire of rifle and grenades. Sergeant William Boulter VC, of 6th Battalion Northamptonshire Regiment, won his award in July 1916 at Trones Wood, France, when he destroyed an enemy machine gun nest. He survived the war and died in 1955. Captain Thomas Colyer-Fergusson, of the the 2nd Battalion, Northamptonshire Regiment, was awarded the VC in July 1917, when he captured an enemy machine gun and captured numerous prisoners. He was killed by a sniper shortly afterwards. Lance-Corporal Allan Lewis, 6th Battalion Northamptonshire Regiment, was awarded the VC on 18 September 1918 for destroying two enemy machine guns that were firing on his company. He was killed three days later. His VC citation reads: ‘For most conspicuous bravery at Ronssoy on the 18th September, 1918, when in command of a section on the right of an attacking line held up by intense machine gun fire. L./Cpl. Lewis observing that two enemy machine guns were enfilading the line, crawled forward singlehanded, and successfully bombed the guns, and by rifle fire later caused the whole team to surrender, thereby enabling the line to advance. This entry was posted in Events and tagged 1915, 1916, 1917, 1918, Arras Memorial to the Missing, Belgium, Captain Anketell Read VC, Captain Thomas Colyer-Fergusson, Footballers in World War I, France, German Spring offensive, Lance-Corporal Allan Lewis, Lieutenant Walter Tull, Middlesex Regiment, Northampton, Northamptonshire Regiment, Ronssoy, Sergeant William Boulter VC. Bookmark the permalink.